Successful plein air watercolour painting starts with getting the right materials together. My own kit is basic and remains essentially the same whether I’m painting on holiday in the Mediterranean or as war artist in Afghanistan. My kit contains: watercolour paints, paper or a sketchbook, pencils, erasers, brushes, masking fluid, clean water, a receptacle for rinsing. I always bring a good hat, especially in hot climates. I often pack a very small folding stool. This sounds straightforward, but it’s easy to forget a vital element, especially if you are traveling on foot, which I like to do when I work. To avoid leaving anything behind, I keep my painting kit together in the same small rucksack, so that it’s always ready. Then I can be certain I have everything I need when I head out. Rough and ready. 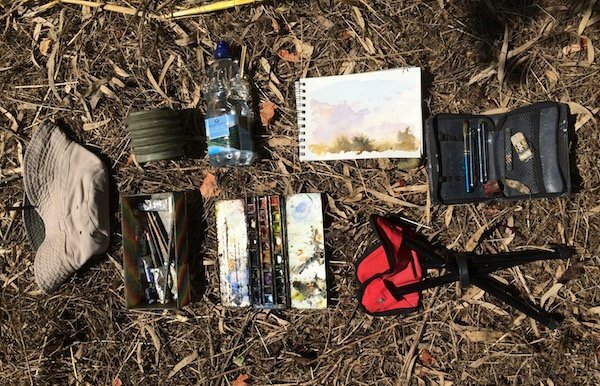 Michael’s basic travelling kit for plein air watercolour painting, from left: hat, collapsable water container, water bottle, watercolour paper sketchpad, set of compact watercolour brushes, camp stool, watercolour set, box of miscellaneous pencils, erasers, masking fluid, etc. When you do plein air painting, you have to be open to what is out there. You may have to wander around in an aimless way until you see something that will justify the time you take to paint it. If you’re too specific about what you’re looking for, you may never find it. The time of day and the quality of light are more important than the particular subject. Whether it’s a tree, a building, or a rock, it’s the light that makes it interesting. An object that looks interesting in one kind of light may look dull in another. You don’t have the freedom to wait around with plein air painting. If you see something and it looks right, you have to seize the moment and get down to work immediately. A couple of hours later, when the light changes, it may have lost its visual interest. Whether your subject is a tree, a building or a rock, it’s the light that makes it interesting. Comfort is an important factor when painting outdoors. You have to be practical. If you’re too uncomfortable, you can’t do the work at all. It can be impossible to spend too much time exposed sunlight, for example. The best vantage for painting may actually be impractical to work from because it’s too hot or too exposed to the wind. You have to think about where you’re going to position yourself as you begin the painting. Are you standing up? Are you sitting down? If you’re sitting down, is there a place to sit? Is there enough shelter? Exactly like having the right materials, position is fundamental: if you don’t get it right, nothing else will fall into place. 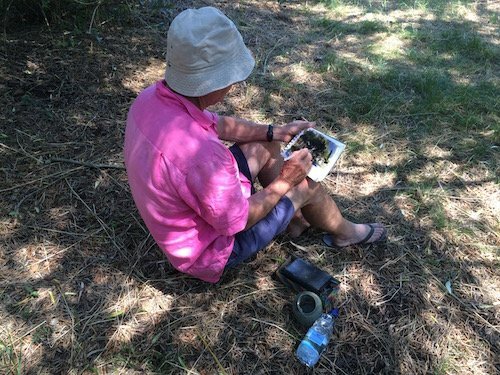 Finding a reasonably comfortable position to work from is vital in plein air painting. 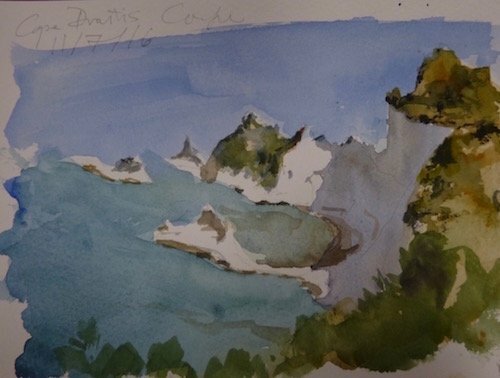 This doesn’t mean you can’t choose a challenging vantage point, such as in this view of Liapades Beach, which I painted from a clifftop. In midsummer in this part of the world, the light is extremely strong and so contrasts are sharp and shadows are very dark. 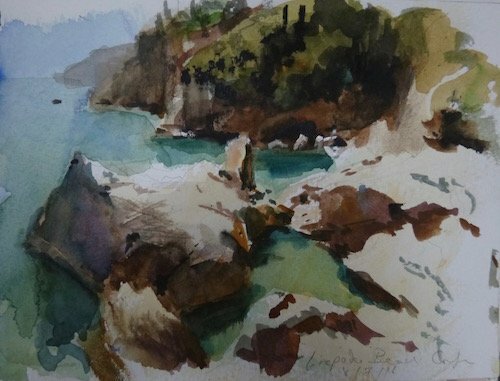 It’s easy to use watercolour in a wishy-washy, faded-out sort of way but that doesn’t communicate the brightness of Mediterranean light. To successfully convey the impression of bright light you have to have a bold, contrast-y palette. Watercolour doesn’t lend itself to this effect as well as oil paint does, but it can be done. Go bold: Strong contrasts help convey the feel of bright Mediterranean light. 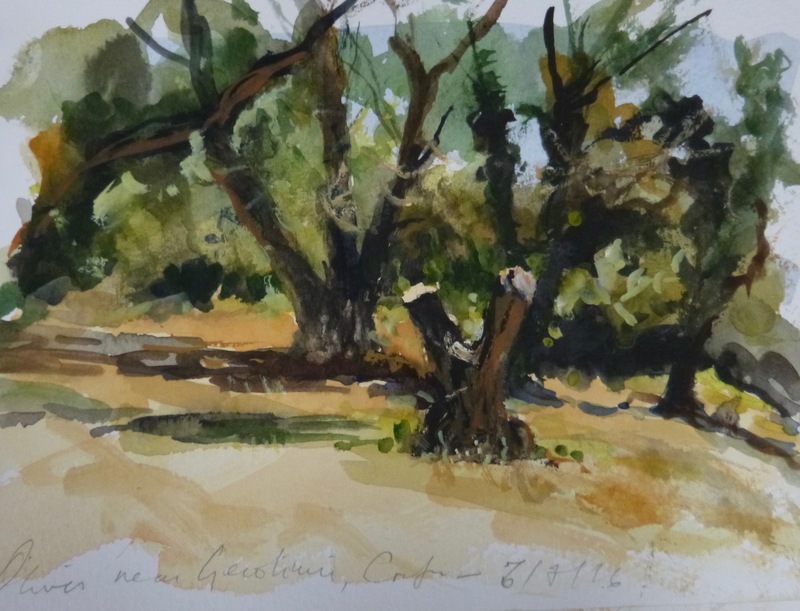 The wonderful thing about painting in the Mediterranean is that the weather’s reliable. You can be sure that the light is going to be consistent from day to day and that you’re not going to get caught in a rainstorm or a high wind or any of the other things that make painting outside miserable and at times impossible. The downsides are the heat, which can be too much, and insects: mosquitoes, wasps, flies, bees, midges. They can drive you crazy. Sometimes they end up squashed on the back of the sketchbook. But it’s all part of the experience. No insects in evidence, but that doesn’t mean they weren’t there at the time. 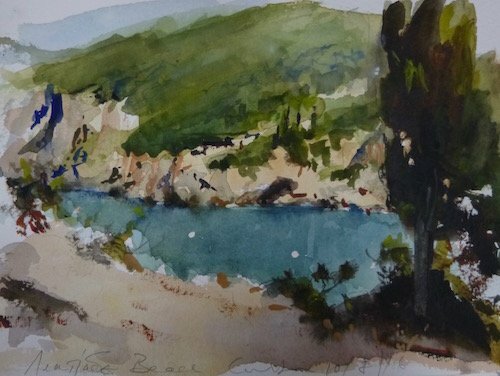 More inspiration: For any artist interested in painting the Mediterannean, Edward Lear’s skilful watercolours of Corfu and other locations are well worth study. Many images are available online. This Times Literary Supplement article Edward Lear in Corfu covers the artist’s bicentenary and provides an introduction to his work. Michael Alford at work in Corfu.